Born: April 9, 1948, in Washington, D.C..
Education: University of South Carolina, BA, 1970. Family: Married Jacqueline Morris; children: two. Address: UAL Corporation, PO Box 66100, Chicago, Illinois 60666; http://www.united.com. ■ For Glenn Tilton, three decades of senior-management experience in the oil industry led to the unlikely post of CEO at one of America's largest airlines. Despite his obvious lack of airline-industry experience, Tilton was aggressively courted in 2002 by the directors of UAL Corporation, the holding company for United Airlines, who apparently hoped that the oil industry veteran's widely touted people skills and management expertise could help turn the troubled airline around. This task proved to be a challenge that Tilton was unable to resist. Tilton first dedicated his time to steering the corporation away from bankruptcy. When, only a few months later, it became clear that bankruptcy could not be avoided, Tilton began the tortuous duty of guiding the airline through the maze of reorganization incurred under Chapter 11 of the U.S. Bankruptcy Code. By early 2004 UAL, under Tilton's direction, had made significant progress in its campaign to return to profitability. Still operating under Chapter 11 protection from its creditors, UAL's net loss during the final quarter of 2003 remained the largest in the airline industry, but the figure had been pared to $476 million, down roughly $1 billion from the $1.47 billion loss posted a year earlier. In announcing the sharp reduction, Tilton told the Rocky Mountain News that UAL was continuing to build "a dramatically different company" but acknowledged that much remained to be done. Born in Washington, D.C., on April 9, 1948, Tilton spent very little time in the American capital, instead growing up in the various Latin American countries where his father was stationed as a CIA agent. Not until he had entered his late teens did Tilton learn the true nature of his father's job. During an extended period in Brazil, Tilton attended high school at the Escola Americana do Rio de Janeiro, from which he graduated in 1966. While a student there, Tilton met and began dating Jacqueline Morris, who was two grades behind him. The couple later married. After finishing high school in Brazil, Tilton returned to the United States and enrolled at the University of South Carolina to major in international relations. Shortly after he received his bachelor's degree in 1970, Tilton was hired as a sales trainee by Texaco's marketing division in Washington, D.C. Over the next eight years, he quickly rose through the ranks at Texaco, holding a series of marketing positions of increasing responsibility in both Washington, D.C., and Pennsylvania. 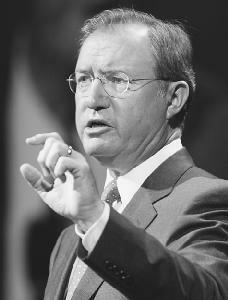 In 1978 Tilton was named assistant to the vice president for Texaco's Northeastern Region. A year later he was appointed marketing manager for the company's Philadelphia division. In 1981 Tilton continued his climb up the management ladder when he was named staff coordinator for the company's Corporate Planning and Economics Department, headquartered in Harrison, New York. He was appointed assistant general manager of sales for Texaco Europe in 1983 and a year later took over as the division's general manager of marketing. In 1987 he returned to the United States to serve as vice president of marketing for Texaco USA, based in Houston. He was promoted to president of Texaco Refining and Marketing in 1988 and the following year was named a vice president of the entire corporation. NAMED CHAIRMAN OF TEXACO LTD. In 1991 Tilton was appointed chairman of Texaco Limited, giving him responsibility for overseeing Texaco's upstream (exploration and production) and downstream (refining and marketing) operations in the United Kingdom, which included a number of major exploration and development projects in the North Sea. His responsibilities were further broadened in 1992 when he was selected to be president of Texaco Europe, managing Texaco's operations in 22 European nations. Two years later Tilton found himself back in the United States, having been named president of Texaco USA, where he became responsible for all of Texaco's integrated businesses in the United States, including exploration, production, refining, marketing, trade, and transportation. In April 1995 Tilton assumed an even higher profile within the executive hierarchy at Texaco when he was named senior vice president. Two years later he was appointed president of the oil giant's Global Business Unit. In early 2001 Tilton was finally named chairman and chief executive officer, a position he held for only a brief period before Chevron and Texaco merged to form ChevronTexaco Corporation. He was named vice chairman of the newly merged company in late 2001 and a few months later assumed additional responsibilities as interim chairman of Dynegy, in which ChevronTexaco held a 26.5 percent stake. As Tilton rose to the highest ranks of oil-industry management in the early 2000s, United Airlines, long one of the world's major air carriers, was experiencing a significant reversal in its fortunes. In 2000 the Chicago-based airline managed to eke out a profit in only one of four quarters, its bottom line increasingly squeezed by competition from low-fare carriers and labor costs that were among the highest in the industry. Matters grew worse in 2001 when the entire industry was shaken to its roots by the September 11 terrorist attacks. In the wake of the attacks, in which two hijacked United passenger jets were involved, the U.S. airline industry experienced its biggest decline in passenger traffic in recent history. To help reverse the downward spiral in UAL's finances, in October 2001 the company replaced its chairman and CEO, James Goodwin, with the former Weyerhaeuser CEO Jack Creighton, who had served on UAL's board since 1998. When it became apparent that Creighton, who was appointed to serve as UAL's interim chairman and CEO, was having little success in turning the company around, his fellow board members once again began searching for a replacement. In early September 2002 Tilton accepted the daunting challenge of trying to reverse UAL's continuing decline. Although he knew that bankruptcy was a distinct possibility, he carefully avoiding broaching the subject when he took on the job, according to John Schmeltzer of the Chicago Tribune . Instead, he focused on the need for all parties at the carrier to work together "to benefit everyone with a stake in United—employees, shareholders, travelers, everyone" (September 4, 2002). Tilton had conditioned his acceptance of the top job at UAL on the removal of the company president Rono Dutta and the CFO Andy Studdert. In the months that followed his appointment, he disposed of another half-dozen senior executives and handpicked the team of managers that would assist him. Tilton's top lieutenants became Frederic Brace, who was named executive vice president and CFO, and Douglas Hacker, Brace's predecessor, who was given the newly created post of executive vice president of strategy. To help stave off bankruptcy, Tilton and his team went to work putting together a plan to cut annual labor expenses by $1.5 billion; in the end, an agreement with United's employees was reached on a plan that shaved costs by only $1 billion. Tilton hoped that this would be enough to convince the federal government to grant the carrier $1.8 billion in guaranteed loans, thus avoiding the need for a Chapter 11 filing. However, to his dismay, UAL's application for governmentguaranteed financing was rejected on December 4, 2002, by the federal Air Transportation Stabilization Board (ATSB), which claimed the bid was based on unreasonable assumptions. Less than a week later, on December 9, 2002, UAL sought protection from its creditors under Chapter 11 of the U.S. Bankruptcy Code. Further complicating matters for UAL was an ultimatum from its lenders threatening to deny further advances on its existing credit lines if Tilton was unable to negotiate an additional $300 million in savings over the next few months. Tilton worked feverishly during this time to slash United's operating costs and trim its losses. In outlining UAL's restructuring progress during 2003, Tilton pinpointed some of the savings that the airline achieved through cutting costs or negotiating with its unionized employees as well as steps taken to increase profitability. One of the most important achievements in 2003, said Tilton, was the adoption of six-year labor agreements with United unions that, between productivity improvements and wage and benefit reductions, would ideally result in annual cost savings of about $2.5 billion. Tilton reported that UAL also achieved annual savings of roughly $900 million in negotiations with some of its equipment lessors and providers under Section 1110 of the U.S. Bankruptcy Code. The internal Business Transformation Office's reassessment of every aspect of UAL's operations with an eye to maximizing productivity was successful; initiatives and strategies put in place by that office resulted in a $1.2 billion increase in profit, exceeding the goal of $1 billion that had been set. Tilton said that the office had laid the groundwork for roughly $1.4 billion in profit improvements for 2004. In order to meet its mid-2004 target for exiting bankruptcy proceedings, UAL filed an updated application with the ATSB in mid-December 2003 for a federal loan guarantee. The revised application sought a total of $2 billion in new financing, $1.6 billion of which would be guaranteed by the federal government. Two major banking institutions, JPMorgan and Citigroup, each agreed to supply $200 million of the nonguaranteed portion of the financing as well as $800 million of the guaranteed funding. Only days after submitting its revised application to the ATSB, UAL filed its monthly operating report with the U.S. Bankruptcy Court showing that it had met the requirements of its bankruptcy loans for the 10th consecutive month in November 2003. UAL's cash balance, as of November 30, 2003, had risen to roughly $2.6 billion, of which $633 million was restricted. In summing up the company's progress toward restructuring, Tilton said UAL had made significant advances in creating a company that was far more customer focused, competitive, and cost effective than it had been in the past. Tilton credited much of the progress to the dedication of United's employees. In January 2004 company press release, he said, "Our work is not done yet. We have made significant progress on restructuring this company, and we will continue to make the tough decisions to successfully exit from Chapter 11" (January 27, 2004). Throughout the reorganization process, Tilton launched a series of innovative marketing strategies to help United retain—and hopefully to expand—its share of the air-passenger market. A 10 percent increase in passenger revenue during the fourth quarter of 2003 over the figure from the same period in 2002 reflected the company's success on this critical front, which outpaced the industry average. Tilton's attempts to attract more of the flying public to United took on many forms. During the final months of 2003 and early 2004, the airline unveiled new routes, strengthening United's global network, as well as incentives and special features designed to attract more flyers. In December 2003 United announced significant improvements to its EasyCheck-in program, allowing customers to use self-service units to manage their itineraries when flying with multiple carriers and also when faced with flight irregularities, such as cancellations due to bad weather. January 2004 brought a number of route expansions for United Express, the airline's network of regional airlines offering more than 1,600 flights daily, mostly short hauls connecting with longer-haul United flights. On January 15, 2004, United announced that United Express was introducing service over five new routes: between Austin, Texas, and both Washington Dulles International Airport and San Francisco; between Birmingham, Alabama, and Denver; between Denver and Raleigh-Durham, North Carolina; and between Dulles and Minneapolis–St. Paul. Days later, the airline offered an additional incentive for members of Mileage Plus, its frequent flyers club, to travel more often: those who flew two round-trip flights from the Northeast to California before April 15, 2004, would receive a free round-trip economy-class ticket to any destination served by United. In late January 2004 United expanded its international flight network, announcing two new global routes to be inaugurated in June 2004 and a third to be added in October 2004. The new routes would link Chicago's O'Hare International Airport with Osaka, Japan; Dulles with Zurich, Switzerland; and O'Hare with Buenos Aires, Argentina. On February 12, 2004, United unveiled its biggest initiative by far in UAL's campaign to bolster the airline's passenger traffic: years in the planning, and one of Tilton's pet projects, United's new low-fare service Ted took off on its inaugural flight from Denver to Fort Lauderdale, Florida. By March 2004 Ted, designed to answer growing competition from low-fare carriers, was providing low-cost flights between Denver and Reno, Las Vegas, Phoenix, New Orleans, Tampa, Orlando, and Fort Lauderdale, as well as between Las Vegas and Los Angeles, Las Vegas and San Francisco, and San Francisco and Phoenix. In early April Ted began flights between Dulles and Fort Lauderdale, Orlando, Tampa, and Las Vegas. In a look back at Tilton's performance in his first year as UAL's CEO, Greg Griffin of the Denver Post found opinions to be mixed. Tilton received a strong endorsement from Douglas Baird, the University of Chicago law professor and specialist in bankruptcy law: "United Airlines is still in business, so he's done very well. If you made a list of the things he's absolutely had to do, he's done them" (August 31, 2003). Less charitable in his assessment was Robert Mann, the president of R. W. Mann & Company, an airline consulting firm, who unfavorably contrasted the performance of UAL's CEO with that of the US Airways CEO David Siegel. "After a year, you knew what Siegel could accomplish at US Airways. There are still huge issues at United. The albatross is still circling" (August 31, 2003). BusinessWeek gave a mostly upbeat review of Tilton's performance, noting that he had "won big cuts from United Airlines unions" and also that the airline's low-fare carrier Ted was, figuratively, about to take off (January 12, 2004). Under Tilton's direction, UAL's financial performance most definitely improved. The company's $476 million loss in the fourth quarter of 2003, although largest among major U.S. carriers, was down dramatically from its 2002 fourth-quarter loss; the figure was comparable to the $111 million and $327 million losses reported by United's two biggest competitors, American Airlines and Delta Airlines, respectively. In fact, although UAL posted the industry's largest losses in all four quarters of 2003, only the January–March period, the first full quarter after the Chapter 11 filing, was not an improvement from 2002 figures. A note of cautious optimism about UAL's future was sounded by Stuart Klaskin, the principal in Miami's KKC Aviation Consulting, who told Denver's Rocky Mountain News , "They've got more people getting on airplanes, and they've got unit costs coming down pretty significantly" (January 28, 2004). However, he projected that it would take at least another nine to 12 months for United to return to profitability. Tilton and his wife, Jackie, lived in the Chicago area, not far from UAL's headquarters in the suburban Elk Grove Village, Illinois. The couple had two grown children. The Tiltons maintained a small ranch outside Santa Fe, New Mexico, where they raised and rode horses, and Tilton enjoyed playing golf in his spare time. In addition to his corporate responsibilities at UAL and United Airlines, he was involved in a wide variety of other professional and civic affairs. He served on the board and executive committee of the British American Chamber of Commerce and also sat on the boards of the American Petroleum Institute and Lincoln National Corporation. Outside of the business sector, he served on the board of directors of the Metropolitan Opera Association. See also entries on ChevronTexaco Corporation, UAL Corporation, and United Airlines in International Directory of Company Histories . Arndt, Michael, and Patricia O'Connell, "Glenn Tilton's Plan to 'Transform' United," BusinessWeek , December 13, 2002. "The Best Managers: Managers to Watch," BusinessWeek , January 12, 2004. Carpenter, Dave, "United Airlines' Parent Company Loses $476M," AP Online , January 27, 2004. "Embattled Head of United Airlines Is Ousted; Goodwin Replaced by Retired Weyerhaeuser Chief Creighton," Seattle Post-Intelligencer , October 29, 2001. Fieweger, Kathy, "Low-Cost Ted May Help United Fly out of Bankruptcy," Reuters Business , February 12, 2004. ——, "United Airlines Parent Narrows Quarterly Loss," Reuters Business , January 27, 2004. ——, "United Names Another Outsider as CEO," Reuters Business , September 2, 2002. "Glenn F. Tilton," http://www.chevrontexaco.com/news/archive/texaco_press/2001/bio_tilton.asp . "Glenn Tilton," Marquis Who's Who , New Providence, N.J.: Marquis Who's Who, 2004. Griffin, Greg, "Analysts Disagree over Performance of United Airlines CEO," Denver Post , August 31, 2003. Kesmodel, David, "UAL Losses Big but Falling: Airline Posts Worst Record in Industry, but Progress Noted," Rocky Mountain News , January 28, 2004. ——, "United Team Stirs Division: Tilton Shakes Up Ranks, but Critics Say It's Not Enough," Rocky Mountain News , February 22, 2003. Reed, Dan, "United CEO's People Skills Get High Marks," USA Today , September 17, 2002. Schmeltzer, John, "United Airlines' New Chief Stresses Working Together, Not Bankruptcy," Chicago Tribune , September 4, 2002. "Ted Takes Off," http://www.united.com/press/detail/0,5137,51663,00.html . "UAL Corporation," Hoover's Online , http://www.hoovers.com/free/co/factsheet/xhtml?ID=11520 . "UAL Corporation Reports Significant Restructuring Progress," United Airlines press release, January 27, 2004, http://www.united.com/press/detail/0,1442,51608,00.html . "UAL Corporation Restructuring on Track," United Airlines press release, October 30, 2003, http://united.com/press/detail/0,1442,51399-1,00.html . "UAL Meets Bankruptcy Loans Requirements," AP Online , December 23, 2003.